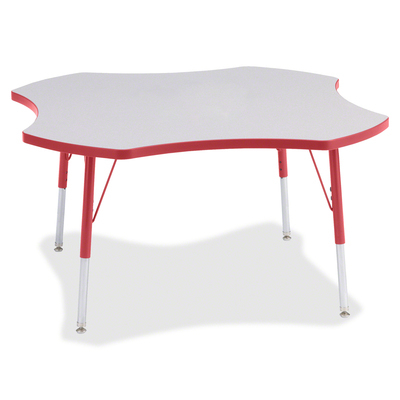 This Four-Leaf Activity Table Provides The Perfect Seating Arrangement For Up To Four Adults. Durable Laminate Features An Easy-To-Clean Surface. Truedge Is Permanently Thermo-Fused To The Edges To Prevent Chipping. Extra-Safe, Dual-Screw Steel Legs Allow You To Easily Adjust The Height Of The Table. Powder-Coated, Adjustable Legs Can Be Repositioned In 1" Increments To Provide Maximum Comfort. Leg Guides Reduce Squeaks, Prevent Snags And Eliminate Rusting.. This Four-Leaf Activity Table Provides The Perfect Seating Arrangement For Up To Four Adults. Durable Laminate Features An Easy-To-Clean Surface. Truedge Is Permanently Thermo-Fused To The Edges To Prevent Chipping. Extra-Safe, Dual-Screw Steel Legs Allow You To Easily Adjust The Height Of The Table. Powder-Coated, Adjustable Legs Can Be Repositioned In 1" Increments To Provide Maximum Comfort. Leg Guides Reduce Squeaks, Prevent Snags And Eliminate Rusting.